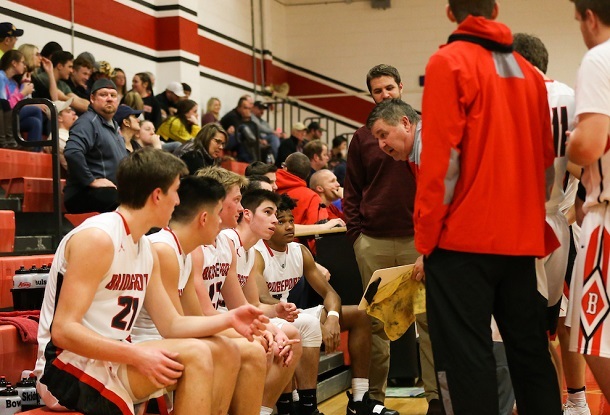 Bridgeport’s boys’ basketball team inched up a bit further in the MetroNews Boys Basketball Power Index rankings, which is now in its second week. The poll has the Indians at 9-1 and ranked No. 8 in Class AA after being ranked No. 9 in the initial poll that came out. The rankings also have Bridgeport listed at No. 17 in the state regardless of classification. Last week, the Tribe was listed at No. 19 overall. The Indians will look to continue to enhance their mark in the next two outings. BHS will host Philip Barbour (5-4) this evening and then will visit Clarksburg to face Robert C. Byrd. The Eagles sit just outside the top 10 in Class AA with a 7-3 record and No. 11 ranking in class. Both games are set for 7:30 p.m.
Bluefield remained No. 1 in ‘AA’ in the poll. The Beavers are 8-0 on the year and are also No. 5 overall. The rest of the Class AA top five includes – in order – Chapmanville (11-1), Fairmont Senior (9-1), Logan (11-1) and Shady Spring (8-1). Martinsburg sits atop of the standings in Class AAA and in the overall standings. The Bulldogs are 12-0 on the year. The top-ranked team in Class A is a familiar one. Clarksburg’s Notre Dame has a 9-1 record to earn the distinction. The Fighting Irish are also listed at No. 31 overall in the standings. Editor's Note: Photo by Joey Signorelli of www.benqueenphotography.com.